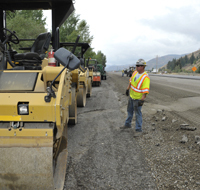 The Idaho Transportation Department announced Wednesday that paving should start today, Aug. 15, on the northbound lanes of a 3.25-mile state Highway 75 road construction project south of Ketchum. ITD advised in a news release that the public should expect temporary closures for at least 30 minutes of access points on the east side of the highway while paving is under way. ITD described paving the northbound lanes as the “last major hurdle” in a highway widening project that started in 2013. ITD still anticipates that the project, contracted to Idaho Sand & Gravel Co. for $9.44 million, will be completed by the end of September. Once finished, the 3.25-mile stretch of highway, extending from Timber Way just north of East Fork Road to the bridge over the Big Wood River near St. Luke’s Wood River hospital, will have two lanes in each direction with intermittent center turn lane and turn bays for access to residential and business areas. ITD reported that paving of the northbound lanes will begin at the south end of the project and proceed north. Once that work is done, the contractor will pave intersection and access points on the east side of the project. ITD reminds motorists to watch for lane changes and traffic impacts while paving is under way. Traffic, now confined to the two southbound lanes, will generally not be interrupted during paving, although occasional delays may occur while flaggers stop traffic to allow construction trucks to enter and exit the work zone.